The new Kindle iPad app just became even better. After the latest Kindle iPad app update, Kindle owners and Kindle app users will be pleased with these two additional features. Read your magazines on your iPad in your Kindle. Before this update, I was unable to access my magazines on the iPad Kindle app. Now, users can access their Newsstand items too. 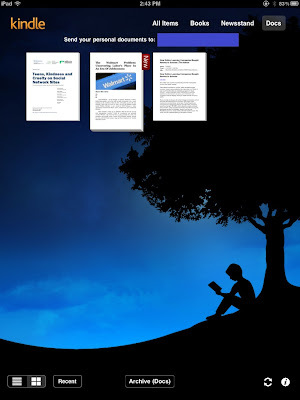 Send documents to your Kindle and now read them on your iPad. Before the update, I was only able to do this on my Kindle. Now, users can access any documents they send to their Kindle account. Add the Chrome Extension, Send to Kindle, and you can easily send Web items to read later using your iPad. I now can easily read those PDF reports right in my iPad Kindle app. Those two added features add a great deal of functionality to the iPad app. Great job Amazon! Thanks for giving users more and more features in your Kindle App.